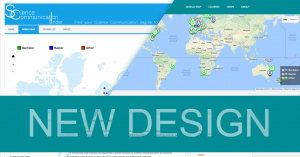 Science Communication finder is a continuously evolving project, and has yet reached another important step in its evolution. We overhauled our database and map system, and redesigned the entire website from scratch. We aim to further improve usability and functionality in the future. Please do not hesitate to contact us for feedback or any questions regarding Science Communication Finder.